Our look at the Spring 2013 Onitsuka Tiger collection, which continued its shoe collaboration with Liberty of London. 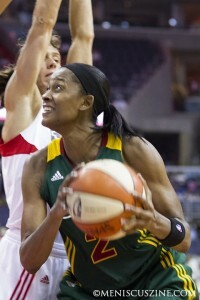 Our interview with WNBA star and two-time Olympic gold medalist Swin Cash was your ninth-favorite article of 2013. We spoke to Cash at the State of Style Summit in New York, where she had a lot to say in particular about women’s basketball uniforms and how she would change them. The “oldest” article in our Top 10 list, our G-Star Raw Spring 2008 review at New York Fashion Week is one of our most widely read in 2013 – proving that Dutch denim never goes out of style. We featured several stars on the 2013 Asian Film Awards red carpet, but Hong Kong actor Anthony Wong ranked the highest. This short roundup, to date, has 235 Facebook likes, partially because of his role in “Ip Man – The Final Fight” (which opened the Hong Kong International Film Festival that same week), but mostly because he presented an award to Filipina actress Nora Aunor, whose countrymen and women made sure that the post went viral. Mentions in publications such as Jezebel, and film festival screenings in Hawai’i and Austin propelled our behind-the-scenes look at the Asian American indie film “A Leading Man” into our 2013 Top 10. Directed by Steven J. Kung, the film features an Asian male actor – played by Jack Yang – who has trouble finding work in Hollywood. Barely a month has passed since it hit the screens in Asia, but our review of “Firestorm” is already in our Top 10 most-read articles of 2013, no doubt due to the star power of Andy Lau Tak Wah and Gordon Lam Ka Tung, who both appeared at the world premiere in Singapore. Coming in at #4 was the long-awaited return of actress Erika Sawajiri in the Japanese plastic surgery horror film “Helter Skelter,” based on a manga of the same name. A rubber duck sails into our #3 slot – more specifically, a giant inflatable yellow duck designed by Florentijn Hofman that proudly floated in Hong Kong’s Victoria Harbour, braving storms and surviving a deflation (although, unfortunately, it exploded in Taiwan on New Year’s Eve). Our second-most popular article last year was our world premiere review of the Hong Kong trio of horror short stories, “Tales from the Dark Part 1,” each directed by Simon Yam, Lee Chi Ngai and Fruit Chan respectively. Originally conducted as part of our 2012 Asian American International Film Festival coverage, our interview with actor Daniel Henney was your favorite article of 2013. The “Shanghai Calling” star talked about a whole range of topics, from why his early work now makes him cringe to his mother’s background as a Korean American adoptee to why Michigan will always be home. Note: Copyright reasons prevented us from using the clip with the original J-pop music. For that version, go to our link on Vimeo.